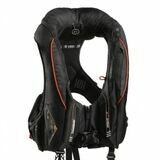 An Baltic Automatic 150 N Standard lifejacket that inflates upon immersion with positive integral foam buoyancy of 55 N with an Integrated Deck Harness. Total buoyancy when inflated 220 N. Intended for general application and or use with foul weather clothing. It will only turn over into the safe back position once it has been inflated. The Rib has 55 N of permanent buoyancy with an extra 165 N that automatically inflates upon immersion. The integrated harness has a robust attachment point at the front. The Rib also features Two front pockets, the Argus window to check the status of the cylinder / cartridge and a cylinder retainer. The lifejacket can withstand extremes in temperature of between -30 and + 60˚C, but should not be stored in direct sunlight. 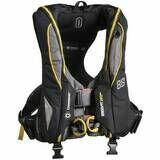 Designed exclusively with Abu Dhabi Ocean Racing, based on the highly successful Crewsaver ErgoFit lifejacket collection, the ErgoFit Extreme maintains all of the high specification safety features of the ErgoFit 290 N whilst providing essential performance attributes for the serious ocean racer. ISO 12402-2 (275 N) approved but with superior buoyancy (290 N) to float you higher in the water. Dual buckle system and side waist adjusters, uniquely designed to ensure swift donning. Robust 500D Nylon Heavy Duty cover. High quality hanging loop built into the jacket, makes hanging the jackets below deck as simple and efficient as possible. 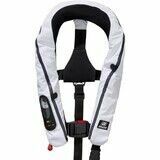 A built in inflatable chin support tilts your neck back and keeps your airways clear. Unique bladder distribution, providing turning solutions in less than three seconds. AIS compatible, activates automatically on inflation. Inflatable lifejacket meets the SOLAS and EU requirement standards, 275 N. According to regulations, all lifejackets come with a light, whistle, reflective tape, lifting strap, buddy line and two automatic inflation systems. For added safety mounted crotch strap has been added. Optional items: sprayhood, PLB pocket and PLB. 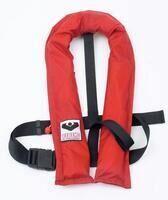 Inflatable lifejacket meets the SOLAS and EU requirement standards, 180 N. According to regulations, all lifejackets come with a light, whistle, reflective tape, lifting strap, buddy line and two automatic inflation systems. For added safety mounted crotch strap has been added. Optional items: sprayhood, PLB pocket and PLB. Viking inflatable lifejacket, model Conquest Harness. 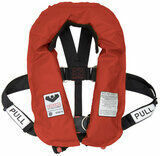 Lifejacket with gas inflation, 150 N. Perfect for sailboat crew or safety employement in case of heavy sea. Automatic and manual. UML version. CE approved. Inflatable lifejacket meets the SOLAS and EU requirement standards, 220 N. Thanks to a completely new design AERO life jackets are very ergonomic and comfortable to use. Pro model has UML Pro trigger with inspection window and with a secure metal buckle. A back piece which improves fit and 220 N of lift – enough for a bigger person too. The Crewfit 165 N Sport uses the latest 3D technology, ensuring maximum comfort levels. Entry level to the 3D range, the Crewfit 165 N Sport has the essential features to ensure the recreational user remains safe when out on the water. 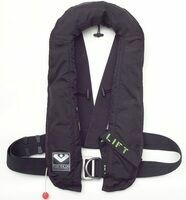 Key Features: ISO 12402-3 (150 N) approved but with superior buoyancy (165 N) to float you higher in the water; Designed with a Peninsular Chin support, to keep your airway well clear of the water whatever the conditions; Attachment point for Crewsaver Surface Light; Soft loop D-ring for attaching safety harness; Robust outer cover for durability; UML MK5 Automatic or Halkey Roberts 840 Manual operating heads; Centre buckle adjuster; Crotch strap; Oral Tube; Whistle; Reflective tape; Lifting becket. 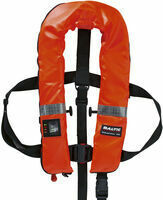 The Baltic 150 N Winner Industrial Zip Inflatable Life Jacket is the ideal lifejacket for professional fishermen. It is designed with a durable polyurethane outer cover which is highly resistant to flames, industrial oils, fish oils, mould, UV light and heavy abrasion. Offers easy re-closing of the outer cover with a robust spiral zipper. M.E.D./SOLAS approved. Optional accessories: sprayhood, emergency light, crutch strap. 5-years guarantee. 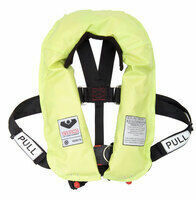 Marinepool inflatable lifejacket, model Securituc, 165 N. The ultra lightweight design makes Security comfortable to wear. Metal buckle. Hammarl version. CE approved. 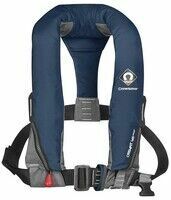 Omega inflatable lifejackets 275 N complies with ISO 12402-2. 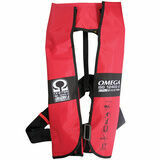 Omega gas inflation lifejackets’ slim fit, light weight design and rugged constructions are combined to form the ultimate life jacket technology. The inflatable bladder, which is made of High Visibility Yellow fabric, is folded into a nylon red valise with Velcro closure and it is also equipped with Lalizas retro reflective tapes and whistle. They are provided with lifting loop and heavy duty D-ring for easier rescue. 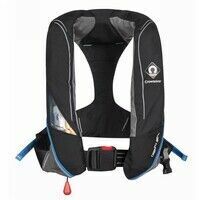 Marinepool inflatable lifejacket for children. The ultra lightweight design makes Survivor comfortable to wear. Metal buckle. Automatic version, UML. CE approved.